Aplus is one of the veteran companies in the web hosting industry with an international presence. The company owns efficient data centers and offers web hosting and design services to American and international clients. Regular discount coupons and 99.9% uptime make Aplus an affordable and reliable company for clients. Aplus has an enviable history since it was formed in 1992. The company started offering web hosting services in 1998 and is part of the Deluxe Group. One of the oldest companies in the web industry, the company has operations worldwide and employs 250 people. The large clientele includes more than 100,000 customers and 113,000 websites hosted since 2003. Aplus offers competitive domain hosting, web hosting and design services to clients. Since it has been around in the industry even before it formally took off, Aplus knows that providing a well-rounded customer support service is vital for long-term success. The company offers a Live Chat service for instant responses to customer queries. Clients can also call up the company on a toll free number within North America and internationally. While customer service is offered 12 hours a day on weekdays, technical support is available 24/7. Clients can also email the company for any queries and even fill up a contact form on the website. Aplus maintains a robust and efficient network of data centers that allows it to offer seamless service to clients spread across the world. The company owns and maintains its proprietary servers in Miami, Toronto and Dublin that serve North American and international clients. All three data centers are based on NetApp technology and RAID4 systems. To maintain high server efficiency, the company uses Cisco 6500 switches and a cluster design. This means that the system is up and running almost all the time. Aplus offers web design services along with hosting plans. The company has a highly secure international data center network. Aplus offers a highly customer-friendly control panel that includes features wells suited for business growth. The company enjoys a strong positive reputation in the industry and among clients. The services can be easily used to create websites for mobile devices. The Basic web hosting plan includes 100GB data storage and 500GB data transfer along with 2 hosted domains and a 2GB email box. This plan starts at $9.99 per month. The Business web hosting plan includes 300GB data storage and 3000GB data transfer along with 20 hosted domains and a 5GB email box. This plan starts at $19.99 per month. The Professional web hosting plan includes unlimited data storage and data transfer along with unlimited hosted domains and a 2GB email box. This plan starts at $29.99 per month. In addition to the hosting plans, Aplus also offers SSL certification at prices ranging from $25.00 per year to $200.00 per year. Aplus guarantees 99.9% uptime to its clients. This allows it it offer the best reliability and performance to its clients. The company also offers a conditional promise of giving their clients extra credit for their hosting services if uptime is less than the promised level. Since every website owner wants to use a dependable hosting service that won’t break down during service delivery, this guarantee offers much needed security and assurance to the customer. In an environment where many web hosting companies are offering unlimited data storage and bandwidth, Aplus restricts these features only to the Professional web hosting plan. The company offers a limited variety of services considering the fact that it is one of the earliest companies around. Other companies offer VPS, dedicated and cloud hosting which Aplus does not offer. Some clients have had disputes with the company over billing issues. Customer support times are limited which is inconvenient for international clients. Aplus regularly offers discount coupons that entitle owners to attractive discounts on the service plans. The discounts range from 15% to 25% off on hosting, web design and marketing services. Aplus is a Microsoft Gold Certified Partner. In 2009, the company was among the 5000 fastest growing companies in the United States. 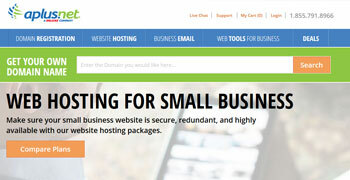 In 2007 and 2008, the company was ranked the number 1 web host by Tophosts.com. The US Commerce Association awarded Aplus the 2009 Phoenix Award for its online service quality.